Fig. 1—Any reduction in thickness will create a higher local stress compared to other areas. Studying the various properties of steels and other metal alloys, one property stands out as the best and most powerful: the workhardening exponent (n-value). 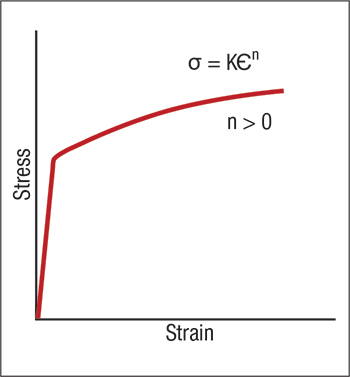 This property, obtained from the stress-strain curve, cannot be measured as a single point, as can tensile strength. 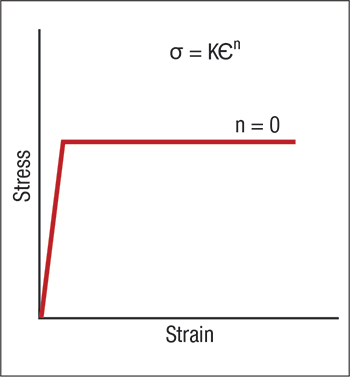 Instead, many data points from 10- to 20-percent strain in the stress-strain curve are used to develop the n-value equation. Traditional high-strength low-alloy (HSLA) steels have used this n-value since the 1970s. For these steels, n-values are mostly constant or have a narrow range. In contrast, the n-values of advanced high-strength steels (AHSS) are constantly changing and are measured and reported as the instantaneous n-value. Fig. 2—A zero n-value will not increase the stress (strength) as the strain increases. Fig. 3—A deep reduction in thickness will cause strain to create a highly localized gradient and early failure. Fig. 4—The higher the n-value the faster the stress of the material will increase and avoid gradients. Fig. 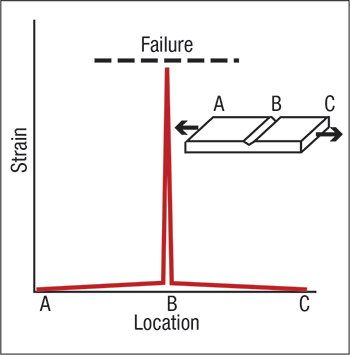 5—The application of n-value to flatten strain gradients reduces the effects of any notches. To demonstrate how important n-values are for HSLA steels, a series of graphs describes what happens after elongation of a tensile specimen (Fig. 1). This specimen is uniform along the length except for a deep scratch, gouge or some other removal of steel in area B. This material removal causes section B to have a higher stress than sections A or C. The n-value is zero along the entire strip. When the specimen reaches the yield stress, area B starts to deform—areas A and C remain constant. The purpose of the n-value is to increase the strength of the steel as it deforms. Fig. 2 shows that n-values of zero cause deformation to increase without any increase in stress or strength. Zones A and C do nothing because all of the deformation occurs in area B. The high concentration of deformation in area B forms a gradient—a narrow localization of strain that can reach very high peak strains (Fig. 3). Failure is easily reached. Now assume that the entire strip has an n-value. 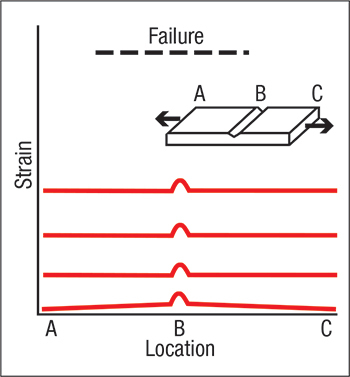 The steel will start to workharden and increase the stress required for deformation (Fig. 4). Deformation starts at area B. After a small increase in height in area B, areas A and C start to deform and reach the strength of area B. Deformation then continues as areas A, B and C move to higher levels of strain. The higher the strain of the entire location the less importance the bump has in creating failure.